The What: Salamander Designs has introduced a new custom cabinet line, Zurich. This line is an addition to the Chameleon Collection, which encompasses AV cabinets engineered to combine art and technology in sophisticated designs that will fit in almost any decor. The What Else: The design aesthetic of the Zurich reflects the shift to earthier tones and deep geometric patterns. 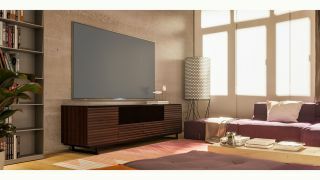 Its opium brown finish on European Larch veneer features authentic grain complemented by black glass top and sides. The durable chassis and adaptable bays provide a “solutions” approach for current and emerging AV storage needs. The Bottom Line: As with all Salamander Designs, Chameleon cabinets are available in more than 24 configurations ranging from single-bay cabinets to quad-width credenzas. Cabinets can be configured to suit any need, such as an integrated center channel loudspeaker for visually unobtrusive home theater applications. Zurich is also available in all the newest Low Profile Wall Cabinets.